Every year, towards the end of August i get a familiar feeling of change and with it a mild anxiety. With the weather being so good at the moment, the change is almost imperceptible. But with the nights drawing in alittle sooner and children being prepared for their return to school, to me it spells the ending of another Summer. This anxiety is most certainly a trace of feeling left over from my school days. It was the lack of routine that came with the holiday breaks that i revelled in. Having never been a morning person, I always remember resenting having to wake up early in the morning for school 5 days a week. For me the new term has already started. I returned to work after over a week off to find a new batch of doctors in the hospital i work in and that same yearning for a lie in. It was therefore fitting that, in an attempt to retain the spirit of Summer, I made Nigella Lawsons Strawberry Meringue Layer Cake for our family games night. This is a lovely cake. Every folkful is a taste of Summer. The meringue in the cake gives it a light and delicate texture. 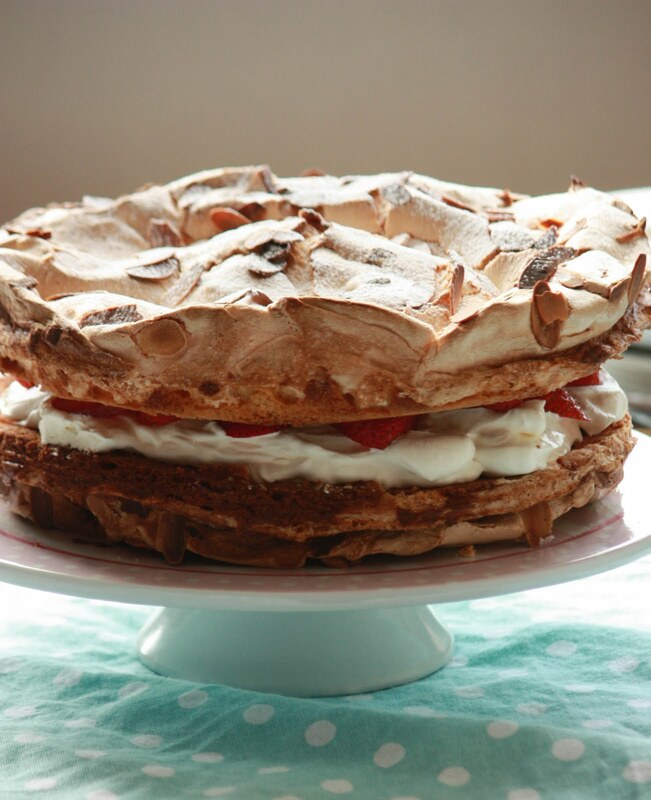 The balance of cream and strawberries with the meringue instantly transports me back to the days of the start of the school holidays, where long days, trips away and plenty of sunshine lay ahead. My sister Mel took the above photo with her Iphone 4, i'm liking the retro feel of it. 2. Weigh out the flour, cornflour and baking powder into a bowl. 3. Cream the butter and 100g of the caster sugar in another bowl until light and fluffy. Separate the eggs and beat the yolks into the butter and sugar, saving the whites to whisk later. Gently fold in the weighed-out dry ingredients, add the vanilla, then sir in the milk to thin the batter. Divide the mixture between the two prepared springform tins. 4. Whisk the egg whites until soft peaks form, then gradually add the remaining 200g caster sugar. 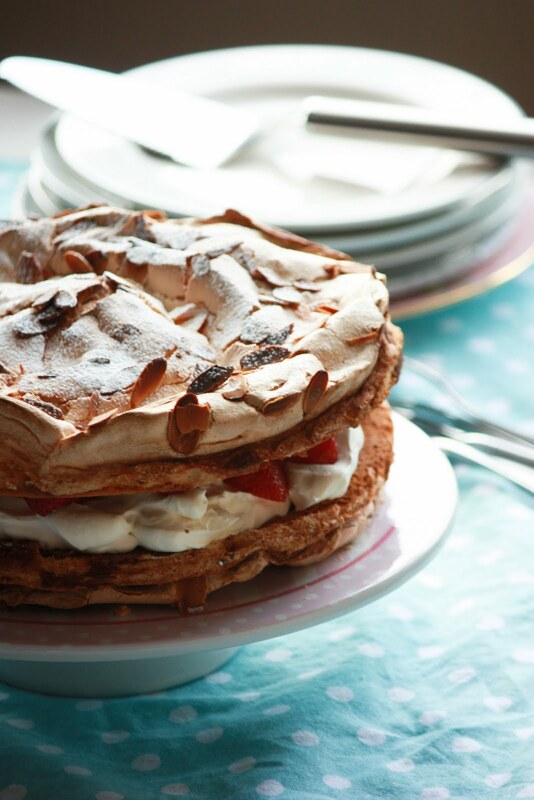 Spread a layer of meringue on top of the sponge batter in each tin and sprinkle the almonds evenly over. I know new doctors! Welcome to national haematoma month. Photos look beautiful and lovely writing. THE best cake on this website so far!! !It was delishhh! Beautiful photos! My mum used to make us something very similar but with raspberries and a layer of chocolate ganache for my brother's birthday. Yum. Iona - Thank you! Love the peaches recipe on your latest post. Sarah - Glad you guys enjoyed it, will make it again soon! Littleloaf - Thank you for your lovely comments. Must try the raspberries and chocolate ganache combination with this one time, sounds devine! Now that's one good looking cake. The meringue looks perfect. :) I'm loving the retro feel of the last photo too. The actors diet - Thank you for visiting and for your lovely comment! That looks SO delicious and the pictures your sister took are fantastic! 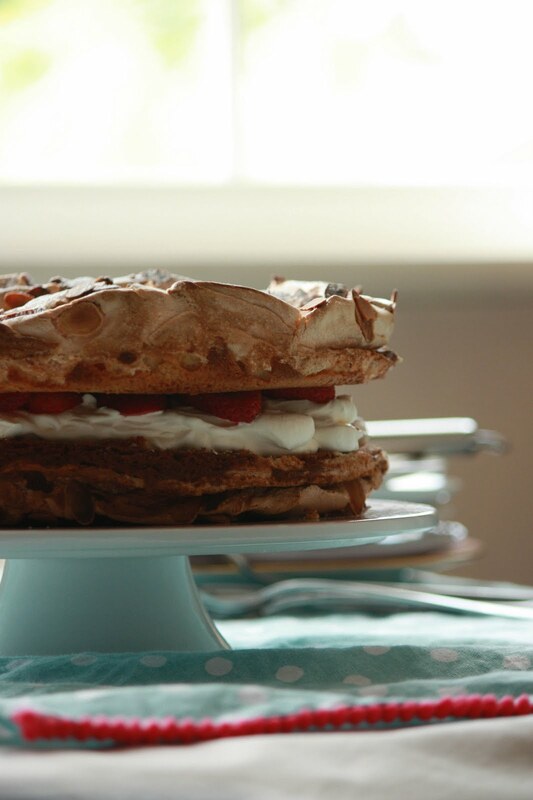 Sweetpeaskitchen - Its definitely summer in a cake!. Lynne - Thank for you visiting the blog, the sis loves using her new photo ap on her iphone! Family Games Night? What games? What were the scores? How can Uncle Thomas get a look in with so many women about?! ?